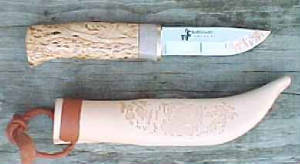 These knives are produced in Karesuando, Sweden, located far north of the Arctic Circle. They have their origins in the hostile Arctic climate. The raw materials are taken from the surrounding country. 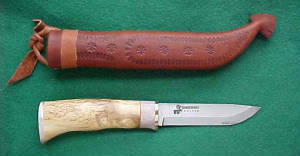 Leather, horn and bone from the reindeer, and curly-grained birch, are the main components. For the technically minded, the stainless blades are 12C27, and the carbon blades are Uddeholm steel #1770 (0.7% C, 0.3% Si, 0.5% Mn). Both are hardened to 57 on the Rockwell C scale. This gives an excellent balance of edge-holding and ease of sharpening. The curly birch handle is a bit over 4". There is just the suggestion of a finger guard. All of these are handmade knives, The blade is 3 15/16" long (10 cm. ), 13/16" wide and .100" thick. It comes with a dark brown sheath with a belt strap rather than a thong. The sheath accepts belts up to about 1 1/2", and has a plastic liner. Sandvik Stainless blade about 4" long, 7/8" wide and .127" (~1/8") thick. 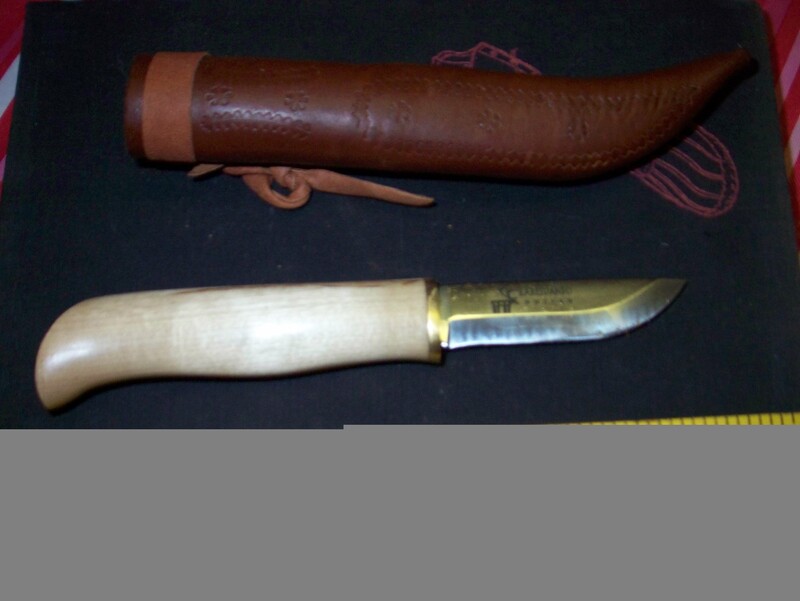 The handle is a basic grain artic birch and the sheath is less detailed other then that, same blade as the K-2 more of a working mans knife. Model K-3 Price 55.00---1 in stock.